Just a third of children play outside everyday, compared to double that number a generation ago. 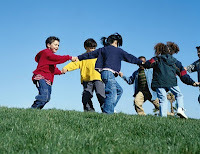 One in ten children play outside once a week or less. Parents resistance to outdoor play included crime and safety concerns, with 87 per cent of parents saying they were worried about letting their children play on the street.At the same time sedentary activities such as watching television and playing computer games had increased. However, almost all parents were aware of the benefits of outdoor play, saying it allowed children to use their imaginations, helped develop physical and motor skills, and reduced stress. One in four parents also said they they simply did not have enough time to play outdoors with their kids any more. Bigger homes with smaller backyards are also affecting children’s outdoor play with not enough room to run around outside or have outdoor play equipment like swings, trampolines etc like we had as children. Professor Anna Bundy, of Sydney University, has said being kept increasingly indoors meant children were leading a more sedentary lifestyle, a major contributor to the obesity epidemic. “It is also contributing to poor social negotiation skills, which leads to more bullying, because they are interacting less with other children,” Prof Bundy said. She urged parents to carefully consider their decisions in not allowing their children to take any risks, and to not to underestimate the capabilities of their offspring. McDonald’s saw the need to assist with helping kids get out there and play and used their association with the Olympic games to promote play in children’s lives. McDonald’s was a global sponsor of the Olympic Games and the McDonald’s Champions of Play competition was a nationwide search for five children aged between six and 14 years of age who embody core Olympic values; confidence, playing fair, teamwork and resilience. As part of the competition, children were invited to submit an account about a time they learnt a valuable lesson through play. McDonald’s chose five winners from over 2000 entries and are sending them accompanied by one of their parents on a trip of a lifetime; to experience the London Olympic Games themselves. McDonald’s spoke to mums cross Australia and identified how similarly important it is for them to instill these values in their children. Aussie mums encourage their kids to play and enroll them in community sports and activities to help them learn what it means to play fair, or how to grow their confidence. The Champions of Play initiative helps children to learn about the values upon which the Olympics and McDonald’s are founded; real human values that parents care about, values that children can learn through play! How do you get your children to play? Are you guilty of not making them play enough? Do pressures of everyday life now limit the time we have with our kids? What are your thoughts? *This is a sponsored post but opinions are my own.